Your backyard shed is full of older things, and you cannot find the time and energy to clean it out? Better Cleaning Company is a professional rubbish removal Hounslow TW company which specialises in domestic & commercial garbage clearing and disposal. Get in touch with now - 020 3746 3201. Our hassle-free rubbish collection service is performed by specially educated, trained specialists. They are all vetted and fully insured. Don`t wait to ask for an advice or discuss the waste disposal in Hounslow with the operators until they find the ideal solution for you. It`s their job. Note that the service is first quoted, because neither the price tag nor the duration is fixed. The junk removal professionals come to examine the house – loft, garage, apartment, home, basement, commercial IT or Tyre building, stockroom, etc – to see its size and to check the volume and the type of the rubbish. Then, the cost is fixed and the date for the junk removal is settled. When you consent, the removal staff are ready to respond ASAP! Dealing with building waste is a real headache if you are not equipped with the right tools, transport and if you have to do it all by yourself. No worries - we are here to provide you professional building waste removal Hounslow TW according to the laws and regulations. 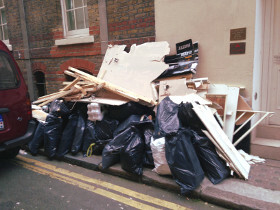 Our service is in particular useful for renovation debris removal and bulky waste clearance. Our staff will do all the hefty loading & lifting of the builders waste. We will help save some time, energy and funds for hiring a van etc. If you want help with the clearance, loading and disposal of junk and some other unnecessary items, book our effective rubbish removal service right now! If your back garden needs cleaning up from twigs, grass, leaves and tree clippings or other garden repair waste, we can offer you affordable and reliable garden waste collection Hounslow TW. Our rubbish collectors are skilled and equipped to collect, load and dispose of your waste quickly and at a fair price. We deliver expert green waste removal, brown waste removal and squander recycling to all neighborhood private and business residents. If you choose to use the expert rubbish removal services in Hounslow TW provided by Better Cleaning Company, all you need to do is get in touch with our customer support by phone 020 3746 3201 or online here. We take orders for free viewings. As a reliable rubbish waste carrier we guarantee you quick arrival of our knowledgeable 2 men teams. Our services are bio-degradable, and we do the recycling instead of you. If you book another service, we will make a price cut of up to 15%. Order today!